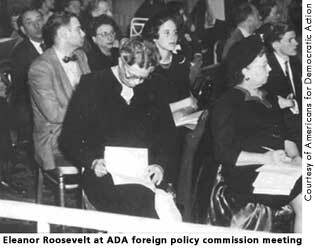 Americans for Democratic Action (ADA) traces its founding to January 3, 1947, when a group of prominent liberals, including ER, gathered to form a broadly based and inclusive liberal political organization. Although the ADA sought to nominate a candidate other than Truman at the Democratic National Convention in 1948, it managed to retain good relations with the president upon his reelection. A bulwark of antiracism and strongly in favor of expanded civil rights, the ADA took early liberal stands on a broad range of social, political, economic, and military issues, including American involvement in Vietnam, the environment, and abortion. Perhaps it is best known today for the annual ratings that it issues for members of Congress based on their positive voting records with respect to liberal causes. Allida Black, Casting Her Own Shadow: Eleanor Roosevelt and the Shaping of Postwar Liberalism (New York: Columbia University Press, 1996), 169. Black, Allida. Casting Her Own Shadow: Eleanor Roosevelt and the Shaping of Postwar Liberalism. New York: Columbia University Press, 1996, 166-169. Buhle, Mari Jo, Paul Buhle, and Dan Georgakas, eds. Encyclopedia of the American Left. New York: Garland Publishing, Inc., 1997, 597. Kirkendall, Richard S., ed. The Harry S. Truman Encyclopedia. Boston: G.K. Hall & Co., 1989, 6-7.